Brenesia 16 (Supl. I): 83. 1979. TYPE: Costa Rica. Lim—n: ca. 1 mile N ofBribri, ca. 40 miles SW of Lim—n; steep ravine above Río Catarata, 50-100 m elev., Croat 43247 (MO-2584489, holotype; CR, F, K, SEL, US, isotypes; Live at MO). 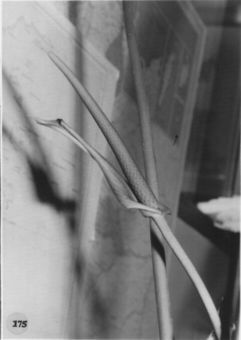 Large terrestrial; stems usually less than 50 cm long, 3-5 cm diam. ; leaf scars conspicuous, 2-4 cm wide; roots few, green, ca. 5 mm diam. descending, often short and blunt; cataphylls coriaceous, dark purple, 9-12 cm long, apiculate at apex, drying brown with tinges of reddish-purple, subpersistent. LEAVES with petioles erect to spreading, 40-150 cm long, 5-8 mm diam., shallowly sulcate to flat adaxially, rounded with a few faint ridges abaxially, tinged dark purple from the base; geniculum 2-3 cm long; blades ovate, gradually acuminate at apex (the acumen long apiculate, turned down), lobed at base, 44-100 cm long, 33-50 cm wide, broadest near point of petiole attachment, the margin shallowly undulate; the anterior lobe 32-80 cm long with margins convex; posterior lobes 12-19 cm long; the sinus usually narrowly triangular, sometimes closed, acute at apex; the upper surface matte to semiglossy, lower surface semiglossy; the midrib acutely raised above, diminishing toward apex and sunken, prominently raised below; basal veins 5-8 pairs, not coalesced, raised above and below; primary lateral veins 9-20 per side, departing midrib at 35°-50° angle, slightly arcuate-ascending, faintly loop-connecting, sharply raised above and below; interprimary veins very few, slightly raised near apex of leaf above, raised below; secondary veins mostly flat above, in part raised, especially in posterior lobes, somewhat raised below; tertiary veins scarcely visible above, scarcely raised below; collective vein usually arising from the second basal vein, inconspicuous, slightly sunken above, slightly raised below, 2-6 mm from the margin. INFLORESCENCE erect, much shorter than the leaves; peduncle sometimes absent or to 20 cm long, 4-5 mm diam., dark purple, terete; spathe coriaceous, dark purple with green splotches (B & K Red-purple 2/7.5), ovate-lanceolate, 6.5-15 cm long, 1.6-3.5 cm wide, broadest at base, abruptly acuminate at apex, rounded to subcordate at base, stiffly curled back lengthwise, frequently twisted at anthesis, inserted at ca. 45° angle on peduncle; spadix purple (B & K Purple 2/7.5), 4-14 cm long, 7-9 mm diam. at base, 4-5 mm diam. at apex; flowers square, 2.6-3 mm long, 1.5-3.5 mm wide, the sides nearly straight; 4-6 flowers visible in the principal spiral, 5-8 flowers visible in the alternate spiral; tepals matte, densely punctate, minutely papillate, the lateral tepals to 1.9 mm wide, the inner margin straight to convex, held flat against pistil; pistil violet-purple, minute and barely exposed 1 or 2 spirals ahead of emerging stamens, gradually larger as stamens emerge; stigma a dry, linear slit when stamens are emerging; stamens emerging slowly from the base, exserted on short filaments which retract to hold anthers in a tight cluster around the pistil; filaments flattened, milky, the exposed part ca. 0.3 mm long. 0.6-0.7 mm wide; anthers yellow, held above pistil, 0.5-0.6 mm long, 0.7-0.9 mm wide; thecae ellipsoid, scarcely divaricate; pollen yellow (B & K Yellow 9/5), drying pale yellow. INFRUCTESCENCE pendent; spathe usually persisting; spadix to 35 cm long, to 2.5 cm wide, the apical one half to one third often not developing berries; berries obovoid, acute to rounded at apex, pinkish with a metallic sheen, darker in the apical third, 9-10 mm long; seeds 2, tan, to 6 mm long, 5 mm wide, flattened, ca. 2 mm thick. Figs. 174 and 175. The species is known only from the region of premontane wet forest-basal belt transition in extreme southwestern Costa Rica at elevations of less than 100 m. It will no doubt be found elsewhere in Costa Rica and Panama on the Atlantic Slope. 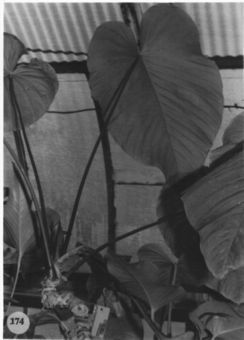 Anthurium schottianum is a member of section Pachyneurium and is distinguished by its large, thin, ovate leaf blades with scarcely any posterior rib (i.e., all basal veins are free to the petiole) and by its short peduncle, its purple spadix and its ovate-lanceolate, often purplish, frequently twisted spathe. Costa Rica Lim—n: 90-200 m, 09.40.30N 83.02.00W, 31 July 1985, Michael H. Grayum & Barry Hammel 5764 (MO). Costa Rica Lim—n: 50-100 m,, 12 Aug. 1977, Thomas B. Croat 43247 (CR, F, K, M, MO, NY, RSA, SEL, US). Costa Rica Lim—n: Río Catarata, 50-100 m, 09.37N 82.49W, 28-29 Nov 1975, Baker & Burger 69 (MO). Costa Rica Lim—n: Río Catarata, 50-100 m, 09.37N 82.49W, 10-13 Feb 1977, Burger et al. 10391 (F, MO). Costa Rica Lim—n: Río Catarata, 50-100 m, 09.37N 82.49W, 10-13 Feb 1977, Burger et al. 10300 (MO). Costa Rica Lim—n: Río Catarata,, , Utley 5500 (DUKE).